We’re back! 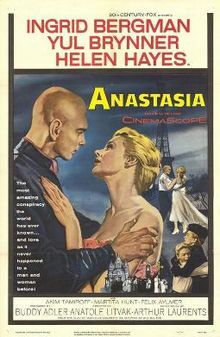 With the next in our Anastasia series! If you didn’t see the first two posts you can follow these links to them. The first is the historical account of Anastasia Romanov and Anna Anderson, read it here. The second is a stage play by Marcelle Maurette, which is where the rest of the Anastasia’s we’ll talk about get their basic plot from (sort of), you can read it here. As with the stage play. I’ll cover three topics: what it is, how it differs from history, and what I enjoyed or disliked about it. Starting here I’ll start to provide comparisons between renditions (the movie versus the stage play). The cast mirrors that the of the stage play with a few additional characters not mentioned here. What we do see is a lack of a Dr. Serensky who comes in the play twice, and is the person they believe Anastasia leaves to start a life with, as we see an inkling of a romance that use to be between them. I won’t spend too much time here, because the plot is very close to the stage play. Taken from Wikipedia the plot is as follows: Set in interwar France, the film follows the story of a suicidal amnesiac, whose remarkable resemblance to the Grand Duchess Anastasia Nikolaevna of Russia — the youngest daughter of the late Tsar Nicholas II — who is rumored to have survived the execution of her family — draws her into a plot devised by the former Russian White General Bounine and his associates to swindle from the Grand Duchess an inheritance of £10 million. However, the ultimate hurdle to their plan is the exiled Russian aristocracy — in particular the Dowager Empress Marie Feodorovna — whom their handpicked claimant must convince of her legitimacy if they wish for their scheme to succeed. This one differsfrom history in the same way the stage play does — we see a very similar cast of characters and basic plot. So I’ll focus on how it differs from the stage play. In the movie we begin to see more romantic subplot. Not as much as you’ll see in later renditions, in fact most of the movie I was quite certain that Anastasia and General Bounine shared no romantic interests. There is a slight flicker of it when he teaches her to dance, and we see his jealousy begin to rise after Anna and Prince Paul rekindle their romance and friendship. But it is hard to tell Bounine’s motives, even Anna accuses him of just being upset that he might not be the one to control her anymore if she married Prince Paul. As mentioned, there is no Dr. Serensky — his part is reduced to simply a man interrupting a press conference to claim he knows her from the asylum, therefore Anna doesn’t run off to be with him- she runs off to be with Bounine! Again in this movie, we see the same differences to history — Anna meets the Dowager, Anna rekindles with Prince Paul. We also note some drastic scene differences from the stage play — the movie starts out in Paris. Once they decide she’ll do, and things get under way they eventually move to Denmark where they meet Prince Paul and see a glimpse of the Dowager at the ballet. This is also the first instance of the ballet (which we’ll see in the next two renditions). Finally they move to the UK, where Anna stays with the Dowager Empress for some time, apart from Bounine and getting to know her grandmother and Paul. Bounine is worried she’ll blow her cover, still not believing her to be the real Anastasia as the Dowager has yet to give any promise that she will endorse this woman. 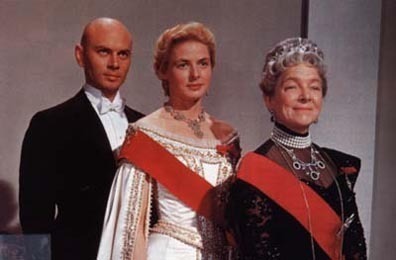 We know that the Dowager has indeed accepted her though, as they two award-winning actresses have a very emotional scene where Anna who knows the truth about herself now realizes she might not be able to convince her grandmother and her grandmother cannot take the lies she’s endured so far to find Anastasia. Eventually though she realizes it is her granddaughter in a moving moment. I feel the biggest difference from reading a stage play versus watching a movie is you get more of an emotional impact. There was certainly more added to the movie to help that along, and while it follows the original script quite nicely they’ve gone above and added more than was there before. Especially in the romance. My favorite part was seeing that slow build up between Anna and Bounine. Of course as mentioned before it’s not quite clear at first. I said we see a hint of it when they are dancing, but it is still kept ambiguous. Bounine mentions something to her about sharing her first dance with a man who loved her. And she comes to believe that meant Paul. In the final scene we see her dancing with Paul, she remarks on how he taught her to dance and he says that it wasn’t him. Anna begins to realize it may have been Bounine. The movie ends with the Dowager talking first to Bounine, then to Anastasia, realizing that these two care for each other but if Anna is named the Grand Duchess — they cannot be together. 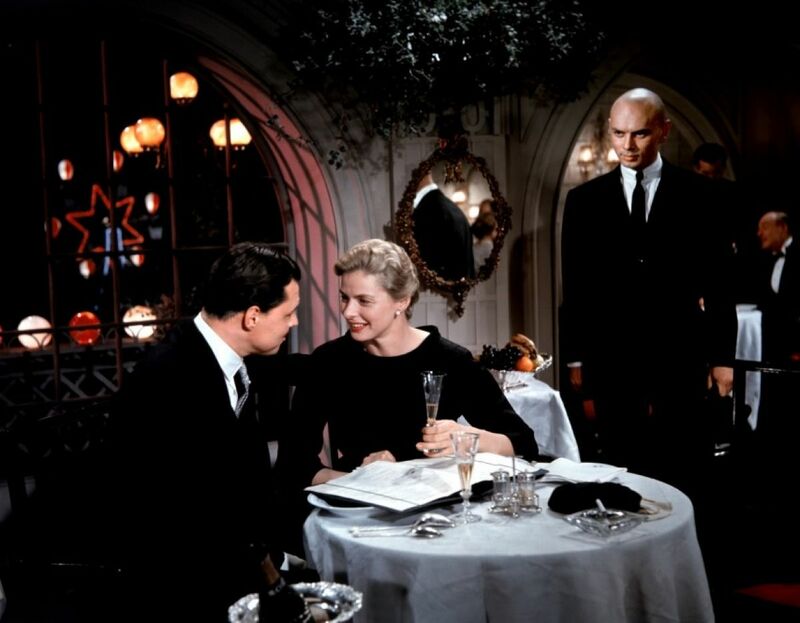 Anna realizes Paul is insincere in his love for her and only wants to marry her for the money and status. Both Anna and Bounine disappear, leaving others scrambling to wonder what to do and much like the stage play it ends with the Dowager saying there never was Anastasia and she’s gone off to find her own life. This time with Bounine instead of the doctor. I liked the costumes as well, we begin to see some familiar costumes if you’re familiar with recent renditions (the cartoon and latest Broadway). I must say, my first time watching it I missed the music of cartoon and Broadway, but it makes up for that in its emotion. Anastasia is well portrayed and does a very good job showing you a woman who is confused, distressed, and longing for family. The movie does a good job leaving the watchers in the dark — is this lady really Anastasia, or not, and as well keeping the romance subtle. It’s very well done and overall I enjoyed the movie! One rendition I am not covering is the original Broadway! That came from the stage play and film directly. Titled: Anya, this musical was produced in 1965.